Atlanta Falcons wide receiver Calvin Ridley had an incredibly efficient rookie season. He posted 821 receiving yards and 10 touchdowns on 64 receptions in 2018. Ridley did this despite sharing the field with an All-Pro target-hog wideout in Julio Jones. While immediate production at the NFL level is an indicator of future success, what can we really expect out of Ridley in 2019? The answer, as you might expect, lies in his advanced stats, metrics and analytics player profile. The best driver of fantasy football scoring is opportunity. Ridley scoffed at that idea last season, as his 15.2-percent target share ranked No. 70 among WRs. This is largely due to the presence of Julio Jones and Mohamed Sanu, both of whom are under contract for 2019. The Falcons are also due for some more wins strictly based on the health of their defense. They will win more games next season, which will lead to more rush attempts and fewer pass-centric game plans. Ridley was also remarkably inconsistent. He scored nearly 40-percent of his fantasy points in Weeks 2-4, then was held to single digits in eight of his final 12 games. Ridley also experienced incredible luck. His 10 touchdowns ranked No. 6 among WRs while his 32 receptions were outside of the top 30. You might think that he was just heavily utilized in scoring position, but his 12.2-percent Red Zone Target Share was No. 76 among WRs and his 19.4-percent End Zone Target Share ranked No. 54. His expected TD total was just 3.6, meaning he scored 6.4 more than expected based on game flow, field position and opportunity. Ridley is also not a prototypical red zone threat. His athletic profile leaves plenty to be desired. Ridley stands at a solid 6-1, but his BMI of 24.9 is in the 10th-percentile among receivers. His 107.7 (2nd-percentile) Burst Score and 9.85 (22nd-percentile) Catch Radius severely limit his ability to consistently convert contested catches in the red zone. Ridley overcame his athletic shortcomings in his rookie season by scoring six touchdowns despite only seven red zone receptions and a lowly 33-percent Contested Catch Rate. Can this production be repeated? Ridley was among the top five wideouts in PlayerProfiler’s signature efficiency metric, Production Premium. His +25.6 Production Premium was easily best among rookies and was fourth-best among qualified receivers, but that number never carries over from year to year. In fact, none of the 59 receivers with a Production Premium greater than 20 since 2014 saw an improvement in the following season. It is all but certain that Ridley’s fantasy efficiency will regress this coming season. His small frame and weak contested catch rate will catch up to him in the touchdown department. He’s also not slated to see an increase in opportunity with the personnel around him. Ridley’s ADP is slowly climbing. 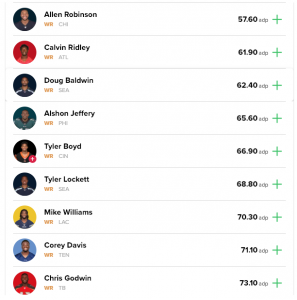 He is currently being viewed as a WR2/3, going in the early part of the sixth round in PPR drafts according to fantasyfootballcalculator.com. 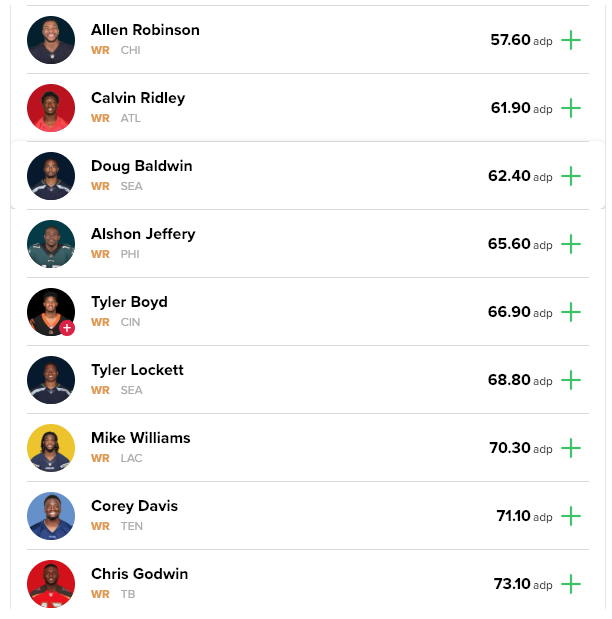 Ridley is going even higher in Best Ball drafts at Draft.com, coming in as the 22nd WR. This is ahead of Doug Baldwin, Alshon Jeffery, Tyler Boyd, and other more athletic and/or proven WR options. Ridley’s NFL draft capital and subsequent high-efficiency 2018 season are driving extreme exuberance and placing Ridley on a trajectory to be one of the most overdrafted wide receivers in fantasy football. 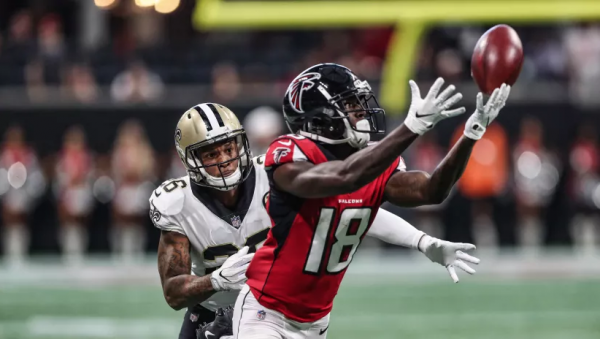 As long as Jones holds steady as the alpha in the Atlanta passing game, Ridley’s opportunities should remain inconsistent while the touchdown rate regresses. In best ball, Ridley is sure to deliver some boom games, but Ridley looks like a hard fade in traditional leagues in favor of more explosive, higher usage options.